Alma is the mother of three children. This fall, all three will be attending one of Tirana's many private schools. She is concerned – "We will have great difficulty in making ends meet, but we have no choice". The monthly fee for each pupil is about 200 Euros. More than half of the salary of Alma and her husband will be spent on private school fees. What remains will be just enough to cover rising living expenses in the Albanian capital. Comfortable hours, fewer students per teacher, organised transportation – private schools are increasingly becoming the preferred option for the offspring of the Albanian middle class. Newspapers and TV programmes are full of advertisements of schools with fancy names. 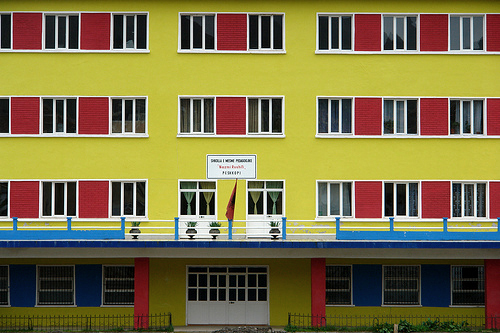 According to data made public by the Albanian Ministry of Education, there are about 547 private schools in the country, from kindergarten to high school. Although there are no accurate data on attendance and the overall percentage of private schools, the phenomenon has been significant for almost 10 years now. The children of the Albanian middle class begin their private education since the first years of life. The costs range from € 70 per month for nurseries up to a monthly average of € 200 for junior high and high schools. It is surprising that Albanians are willing to pay such sums, given that the average salary, according to official data, does not exceed 300 Euros. What forces many parents to spend a large part of their income in their children's education, besides the great importance they assign to school, is the total collapse of Albanian public education after the fall of the regime. "My son wasn't doing well in public school. There were 40 pupils in the class. And teachers were not very receptive to the needs of children. So we opted for a private school", said Alma. In private schools there are no more than 20 students per class, the infrastructure is good, pupils are taken care of even after school hours, and then brought home on private transport. "We work all day, I don't know how we could manage our children without private schools". In fact, there are opportunities for better tuition even in public schools, but this is always difficult and expensive, as it involves the attendance of numerous integrative courses that public school teachers often offer illegally. "In public school you pay all the same, every integrative course costs at least 20 Euros, multiplied for three or four subjects, plus taking the children up and down the city – it is easier to send them to private school”. Before the nineties, teachers were a respected part of socialist society. With the collapse of the regime, they found themselves the poorest among graduates and with no other options on the job market. To keep up with the inflation and consumerism of new Albania, the teachers created a parallel system made of after-class courses offered privately – and illegally, sometimes even forcing their public school students to participate. Psychological pressures, verbal violence, and falling quality of classes are the direct consequences of this phenomenon. Public schools pupils found themselves having to attend school pro forma in the morning and private supplementary courses in all core subjects in the afternoon. Private schools came about to make everyone happy with more decent salaries for teachers and better education for students. But the private system does not seem to have worked out so well. Osservatorio spoke with two teachers who had worked for years in several private schools and returned to the public system. "Teaching in a private school in Albania is like working in any other private sector. You are at the mercy of entrepreneurs. Hardly no one pays pension contributions and you do not have union rights", says Natasha, middle-aged teacher from Shkodra. Normally teachers in private schools do not adhere to any union. As for other professions in the private sector, the rule is: "You either adapt or you're out". The teachers' union is one of the few in Albania that have obtained some rights in recent years. Following various strikes, teachers managed to get a net minimum wage of 250 Euros, 500 for those with more experience. "The private sector does not comply, no one can make them", says a maths teacher from Tirana, also back to work in the public system. Another source of conflict between teachers and owners of private schools are students' grades. "We all know that those who get good grades in public schools are truly good. Public schools have more prestige", said several teachers. "In the private sector, parents and pupils think that paying entitles them to get high marks. So you cannot give low marks, let alone fail pupils. I was forced to give nice marks to students I would have definitely failed in public schools. This is frustrating to say the least", said the teacher from Shkodra. In recent days, a press release from the Ministry of Education put on the alert all Albanian parents choosing private schools for their children. "Please choose recognised private schools", it said. The entity in charge of monitoring eligibility criteria, however, appears to have so far dealt with private universities only. The mere fact that the Albanian Ministry of Education published such a press release speaks volumes about the inefficiency of its monitoring and managing the phenomenon. No study or research, no statistical data except very general ones published by Open Data Albania. Only recently the Office for the development of private education (DZHAP) was created within the Ministry of Education and Science, which monitors and approves the establishment and operation of private schools. But there are no measures against non-compliant schools, and no data or reports on the activities and achievements of the Office. Yet private schools are increasing year on year, advertise their activity like any other private company, and only behave according to the rules of the free market – and so they have for the past 10 years.